We Finnish pilots have been very busy the last three days. On Sunday we first climbed up to our "home" launch at the Cheiron mountain here in Gréolières. We took off in good conditions but fairly soon the forecasted west winds were causing quite a lot of turbulence and we decided to land and have lunch. Later we went to check out Gourdon. 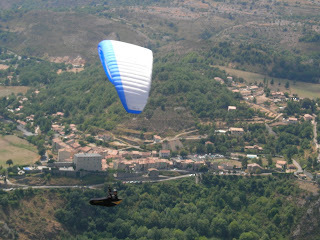 Conditions were a bit weak there, but Tomi got into the air quickly and had a nice flight. The rest of us were too late as the wind changed again to west and even north-west, i.e. over the back. This was the trigger to execute the next step of our plan, which was to drive to the famous Rocquebrune site above Monaco. In the summer flying there is only allowed in the evening as the landing is on the beach, which is crowded during the day. 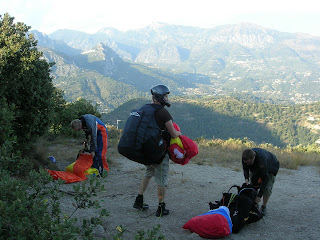 A bit surprisingly the wind at Roquebrune was from the north-east so we had to launch from the rarely used east launch (see picture above). But that worked quite well and Tomi, Juha, Jarmo and Jori all had a beautiful flight. Which was crowned with a nice dinner at the beach restaurant. On Monday we again climbed up to our home launch in the morning. This time it worked better and we all flew some 2 hours (picture below with Juha in front of Cipières) before conditions became strong and lunch sounded inviting. After lunch we set out for Gourdon again where we enjoyed an abundance of lift. In fact we all had to pull "big ears" every now and then in order to get down a bit to avoid flying into clouds.